1WineDude.com has never (and will never) accept sponsored articles, which means that whatever you read on its virtual pages is purely the product of my somewhat deranged mind. I do need to feed my family, however, and so I have been taking some paid writing gigs on the side. One of those gigs has been for the blog of Wines.com, called Wine Crush. That gig is not promoting individual wines, producers, or brands, and I have free reign on the content for my posts – Wines.com just wanted to add the value of quality wine-elated content for their customers (but for some reason, they still chose me as a contributor…). 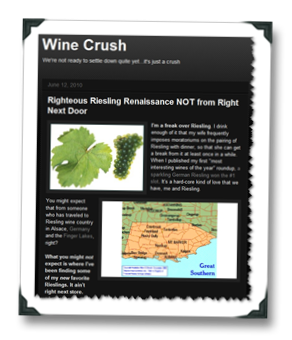 Over the last few months I’ve built up some content at Wine Crush of which I’m proud and thought that I’d cal attention to it here, in case it’s of interest to 1WD readers. 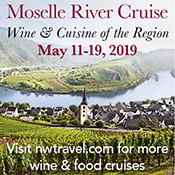 Similar voice, of course, but the topics are a bit different than what I cover here and so I think they’re complimentary (the Wine Crush content is meant more for those at the start of their wine journey, while 1WD remains more in what I like to call the “Intermediate” space, though all are certainly welcome, newbies and experts alike). very cool Joe. another good outlet for your talents. 1) the white on black is OK, but the grey portions are very difficult to read. You might have no control over this, but it is a disincentive to read further. Thanks, Sherman – right on all counts (and further evidence that I need an editor! ).